If you are new to bangles or you need help choosing the right style of bangle as a present, our explanation of the different types and styles of bangles below may help you make a better informed purchase to suit you needs. Guilty Bangles have one of the largest ranges of sterling silver bangles in the UK, with an exclusive collection of handmade silver bangles and a range of engraved bangles. 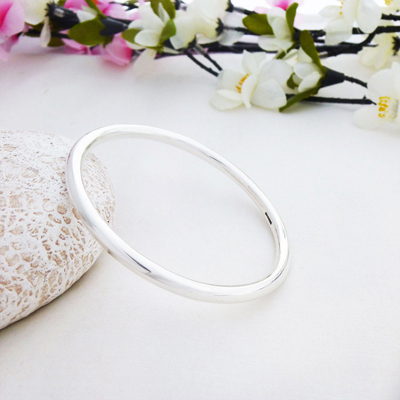 A solid round bangle with no spacers or expanders is the most common style of bangle available. These are typically uniform circular in shape and can be styled with twists or have charms on them. The round shape means that the bangle has to be larger than the wrist in order to slip on over the hand. 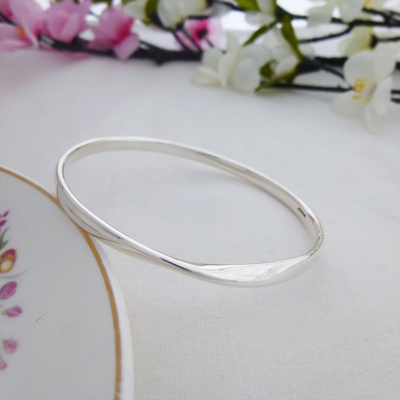 The negative of this style is that a round bangle can also slip off whereas a cuff or torque style bangle tends to be smaller than the hand allowing it to have a closer, tighter fitting contact to the wrist. Round bangles are the most popular style and there are typically a wider variety of different designs available than other variations. The most common metal used for round jewellery bangles is silver as the cheapest of the precious metals and silver bangles are either flat metal, solid round metal or hollow round metal although oval and square are now available. 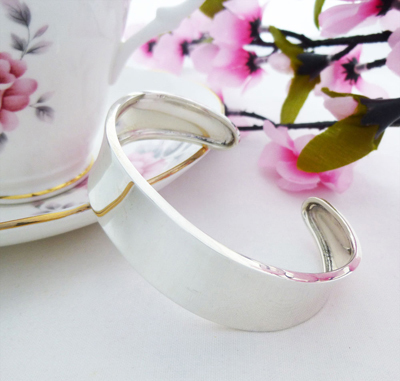 Solid round silver bangles are usually the most expensive, whilst flat silver bangles are the cheapest. As a rule of thumb with trusted silver jewellers, the higher the price, the heavier the bangle weight althoug the detail of the work will also impact prices. Round bangles are sometimes worn with multiple stacking bangles, usually in the Russian slave style as these tend to be thinner and carry less weight. 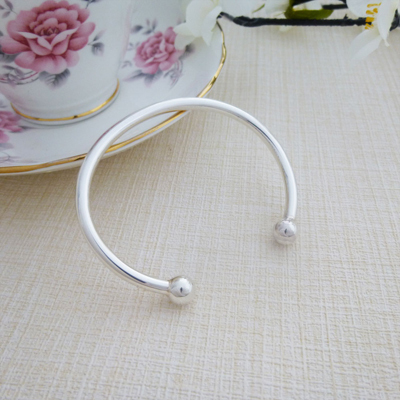 The solid silver thicker round bangles are usually worn individually as they carry more weight and feel more comfortable on the wrist with just one solid bangle. Hollow bangles are lighter than solid silver bangles and are therefore typically less expensive. Above are examples of round sterling silver bangles. Torque bangles are defined as having a gap on one side that allows the bangle to be slipped directly on to the arm above the wrist. The benefit of this is that the bangle will usually be smaller than the wrist and can be worn comfortably without the possibility of it falling off the wrist. The most popular style of torque bangles are the traditional ball ends where either end of the gap has a round ball. This allows the bangle to be slipped on and off the wrist more comfortably than having pointed or flattened ends. Torc, torq or more commonly used torque bangles are thought to have first been developed in the 8th century BC. The word torc or torque comes from latin and means to twist or turn something. The wording became synonymous with torque bangles and necklaces that were made from bronze or gold and could be twisted before hardened gold was introduced as alloyed. 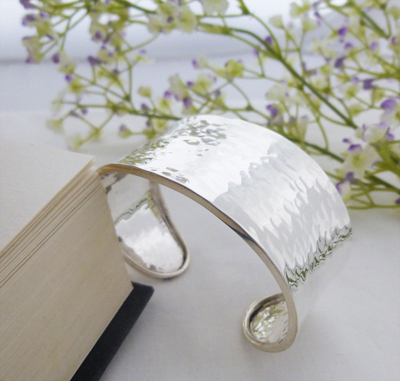 Modern torque bangles can be twisted if the metal is thin although solid sterling silver torques are usually quite stiff as the silver is thicker and alloyed. However, modern torques have a larger gap than the original torques, this allows them to slip onto the wrists without the need for twisting. 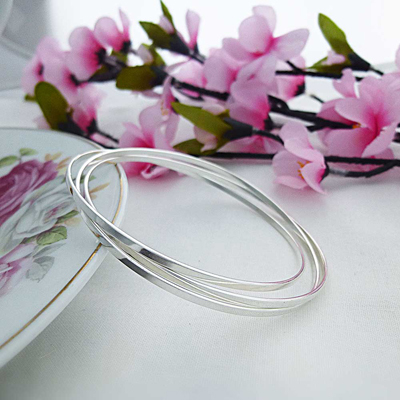 Above are examples of ladies sterling silver torque bangles. 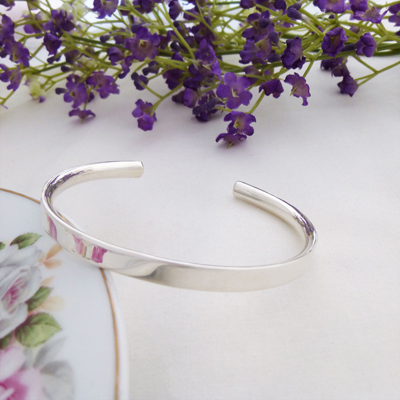 Cuff bangles or cuff bracelets are wider bangles worn around the wrist and tend to be made from flattened and shaped metals, usually in gold or silver, or in materials such as leather. 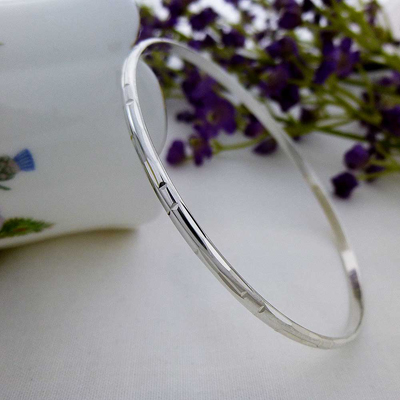 In terms of cuff bangle jewellery, these are usually found in silver and in the UK, this would be 925 sterling silver cuff bangles. 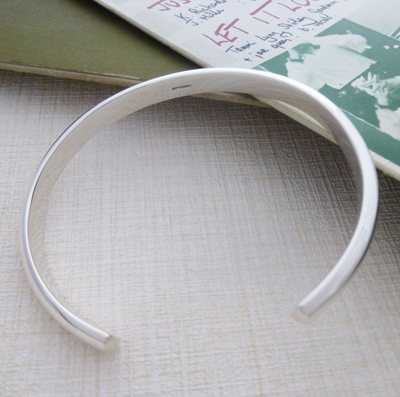 The metal is usually flattened to form the basic shape of the cuff and then rounded so that it can slip onto the wrist. Cuff bangles are like torques in that they usually have a gap so that the cuff can slip onto the arm without having been drawn up the wrist. Above are examples of ladies sterling silver cuffs in wide and narrow. Slave bangles have a very unique history that is reflected in the modern style. The important element that defines slave bangles are that they can be worn comfortably with many on the wrist or upper arm. The slave bangle term is derived from the function of this type of bangle as a currency to trade slaves. Before the abolition of slavery, slave bangles were exchanged by Europeans buying slaves from traders in Africa, before their movement to the America's and typically the West Indies. The higher the value of a slave, the more slave bangles were exchanged. They were also adorned by free women as a measure of the wealth of their husbands, the more bangles that a wife owned, the wealthier her husband. Slave bangles have historically been worn on both the lower and the upper arm. Modern slave bangles are typically made from precious metals such as silver or gold and as multiple bangles are usually worn at the same time, they are usually thinner than traditional bangles being made of thin wire or a flattened metal. Slave bangles are a popular modern choice, especially for those that like to wear large numbers of bangles or to collect them for their value as a jewellery piece. Above are examples of a single round silver slave and three interlinked Russian slave bangles. Engraving of jewellery has existed as long as jewellery has existed. Engraving of gem stones has always been a popular form of personalisation whilst the ancient Egyptians used engraving for worshipping and offerings. 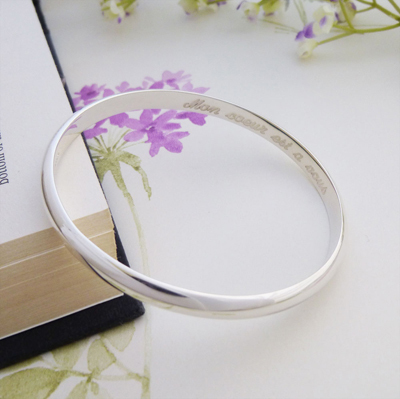 In today's modern world, engraving personalised messages or popular phrases onto a personalised silver bangle is now common place. Engraving has traditionally been a skill adopted by professional engravers with each letter carved out of the metal. With automated CAD machines, it is now more likely that engraving is machined into a piece rather than hand cut. In fact, technology has now blurred the lines as many pieces that claim to be engraved, are actually etched using techniques such as laser and diamond machine etching. Engraving is defined as a cut using a chisel or graver into wood or metal resulting in a permanent marking. With soft precious metals such as silver, engraving should be used rather than etching as the soft metal means that the surface area is easily worn away resulting in the etching disappearing. 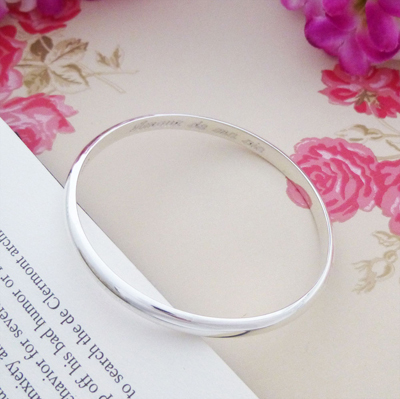 It is therefore worthwhile checking before a purchase is made that the bangle is actually engraved rather than etched. View our new range of sterling silver bangles that can be engraved at www.guiltybangles.co.uk/silver/engraved-bangles where you can choose from a range of custom engraving options. Above are examples of deep engraved bangles with romantic messages in French. Men have been wearing bangles for as long as women, often as part of their culture although due to the nature of the typical precious metals and craftsmanship involved, only the richer men wore jewellery. Traditional men's jewellery was usually adorned as a measure and a show of wealth or for religious regions, especially some Indian religions where gold has long been used as a mechanism for investment saving and male jewellery is still common today. However, as is the case today, wearing jewellery was an event and not for every day wear due to the nature of the traditional male vocation which was typically vigorous and physical. 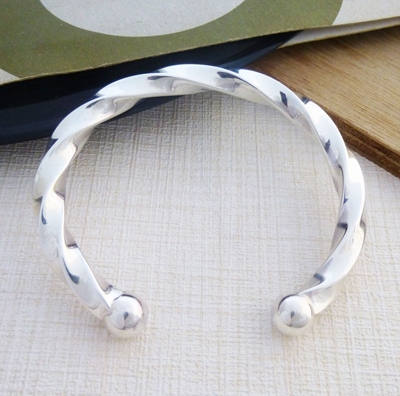 Above are examples of men's bangles in heavy solid sterling silver with both polished and twisted finishes.